Here at Ladyland some of us still dream of becoming Angelina Jolie’s character in Hackers, so we’ve decided it’s high time we got more teched-up. And who better to introduce some of the hot little gadgets that will change our lives (really) than guest writer Sophie Ewen, strategic account director at Blippar – the company that is bringing the physical world to life through smart phones and tablets. I have begun a new career in the tech industry recently – an industry I once thought was just for boys, but these smart examples of wearable tech (not to mention the even smarter women in the biz) beg to differ. 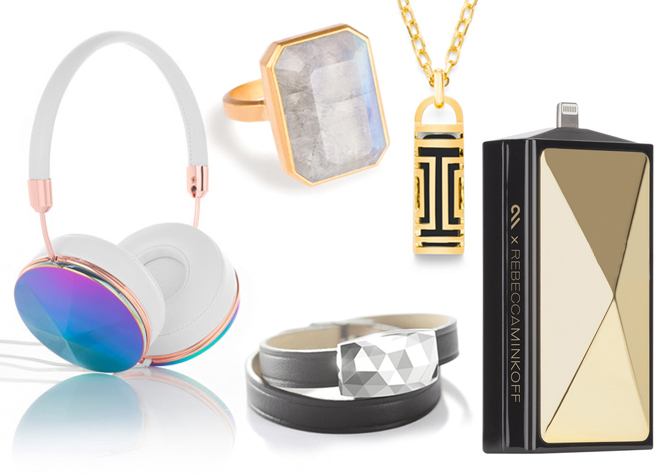 Practical and beautiful – note the designer collabs on the fitness tracker and phone charger – I want them all! 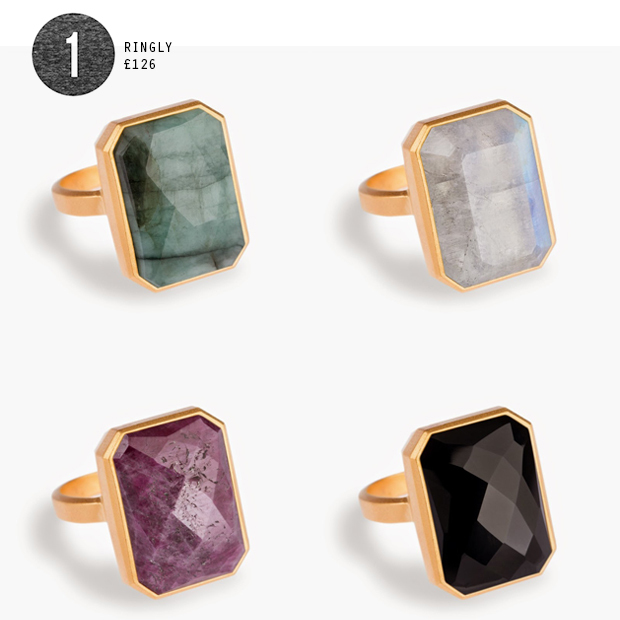 The Ringly is both a beautiful bauble and a super gadget that connects to your phone and alerts you to the things that matter, whether it’s a meeting with your boss or a message from your mum. The key is, it does it discreetly – because being glued to the screen of your smartphone is so déclassé. Through customised vibrations and light, the Ringly allows you to keep your phone tucked away with the peace of mind of not missing a thing. Made with 18K matte gold and faceted precious and semi-precious stones, it is available to pre-order from USD $195. 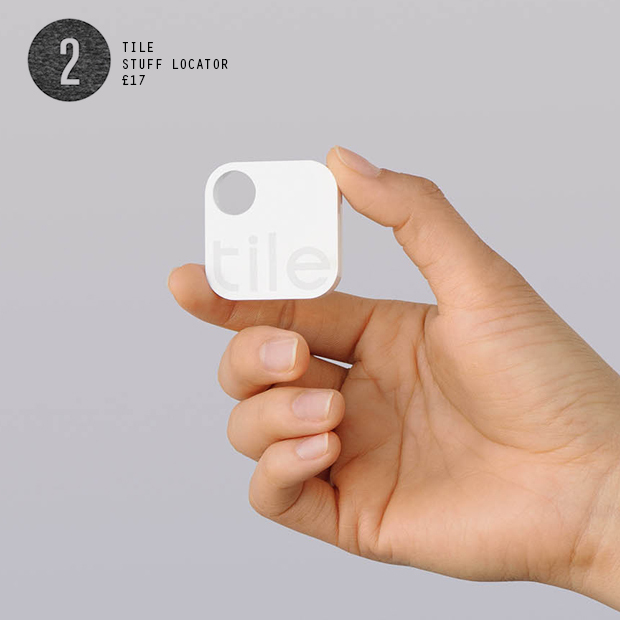 The Tile is designed for the person who is constantly losing stuff (hands up if you couldn’t find your keys this morning). Beautifully small and smart, when attached to your favourite things it connects them to your phone so you can locate them! How cool… I was planning on making my husband a suit from velcro as he has lost too many things to count, but this is far simpler and way more stylish. At a cost USD $25 per tile with offers on multiple purchases, this is an affordable piece of tech that performs a priceless task! 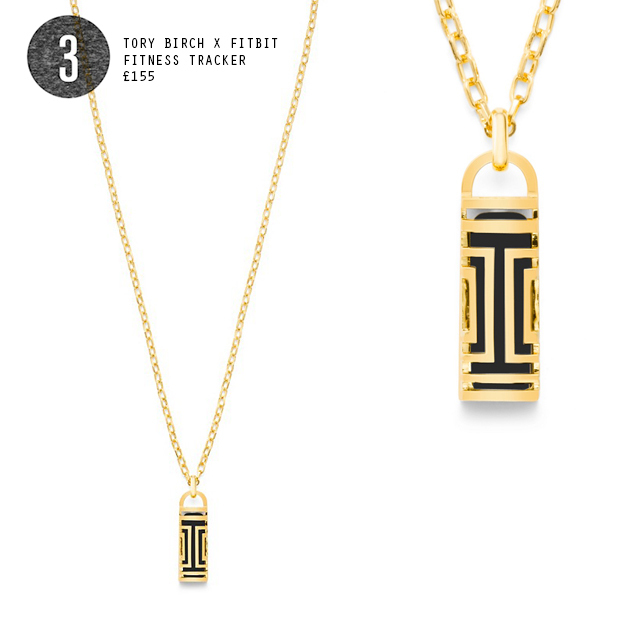 Tory Burch and Fitbit, the Fret Pendant Necklace is for those who don’t want to wear their fitness tracker on their wrist (it might not accessories well with the work wardrobe, darling!). Made of stainless steel, it’s based on the decorative, open fretwork a signature of Tory Burch design. Take note that you need to buy the products separately: that’s £155 for the necklace and if you don’t have a Fitbit Flex that will cost you a further £79.99… but sometimes a beautiful necklace is just worth it! Smart phones have made the need for head phones more important… so why not make them stylish too? 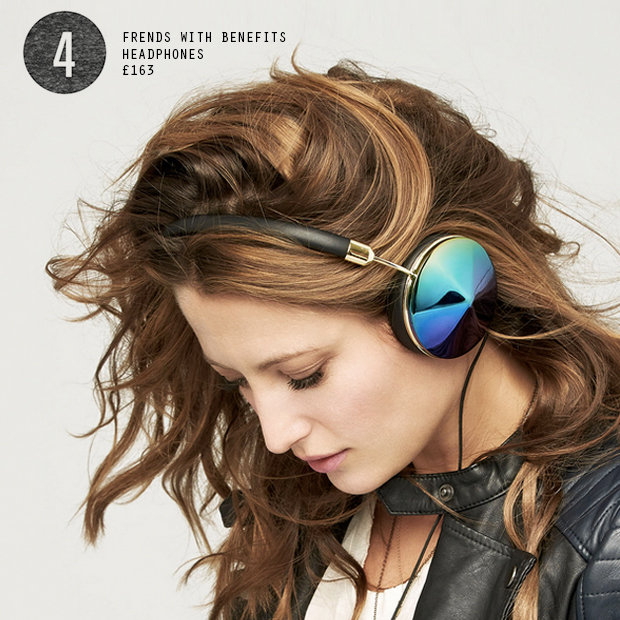 Frends with Benefits has introduced an over-ear headphone range with interchangeable caps to suit your mood or your outfit. In keeping with the approach of combining form and function, Frends has also collaborated with luxury accessories designer Rebecca Minkoff. Prices start from €219.95. 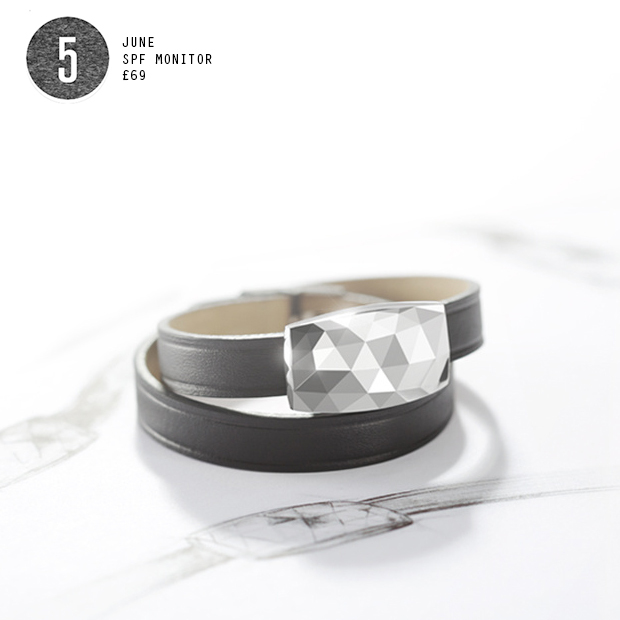 June is a beautifully crafted bracelet that monitors your exposure to the sun, recommending SFP and making sure you don’t get burnt. As with other wearables it connects to your smart phone to deliver the data. Costing €95, you can chose from three colours of Gem placed on either a leather or premium silicone strap. 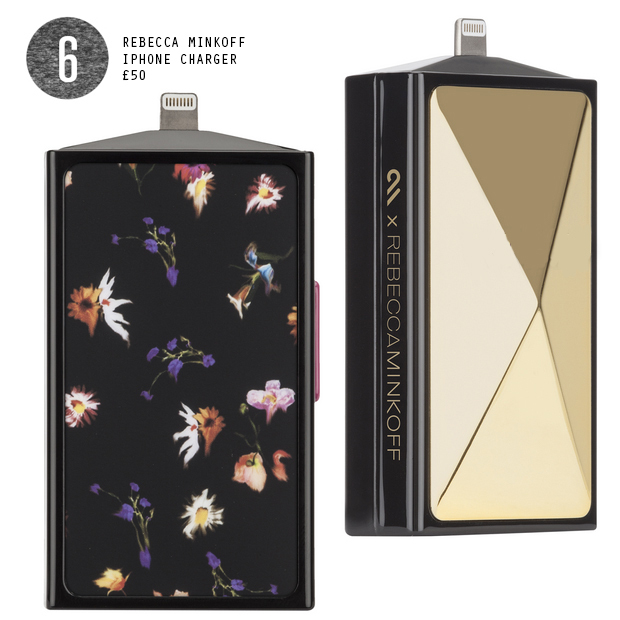 Rebecca Minkoff is back again, this time collaborating with Case Mate: producers of smartphone accessories. Ever found yourself hoping your battery lasts all night just in case the babysitter calls or you can’t look at your phone during an evening of client entertaining? Well look no further than this compact mobile charger. A master class in blending style and functionality, the collection also includes a gold chain-link notification bracelet and studded lighting cable bracelet. An award-winning advertising and media maven with 20 years in the industry under her belt, Sophie Ewen has leapt into the world of interactivity and ‘augmented reality’ at Blippar – which was obviously meant to be, as she’s always had a thing for shiny new gadgets and has was regularly caught taking sneak peaks at her husband’s gadget mags. She’s also notorious for throwing impromptu dinner parties, and has had a long-standing love affair with design: in a parallel life, she would be a furniture designer.